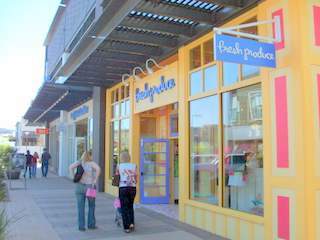 What's Remarkable about SanTan Village? Do you remember stores before there were malls? 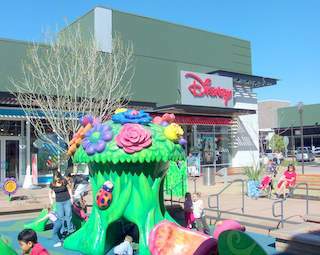 The SanTan Village will bring back the good old feelings because you can walk down shaded sidewalks, look at window displays and park right in front of the store. You can also park at some of the giant parking lots next to the mall. Take a walk and look down the main streets. Adventure down lanes and discover new things to experience. It just feels homey and nice when you visit this outdoor mall. Stores are spiffy and the feeling is upscale. It's fun to wander around and look at all the stuff you can buy. Try out one of the nice restaurants. 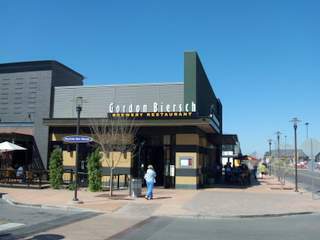 Here’s a picture of the Gordon Biersch Brewery Restaurant. Lunch is elegant, prices seem to be just about right, and best of all the hosts are hometown friendly. Check out the stone fireplace next to the sidewalk where you can enjoy a hand-crafted brew on a chilly evening. 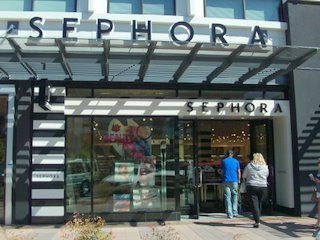 Then there are all kinds of places to get your hard to find cosmetics. For example, Sephora has a huge selection. They have walls of perfumes that you can sample, both for boys and girls. Your man will smell like a perfume factory when you are done with him. Then there’s The Body Shop. Walk in and enjoy the fresh smelling ambience! First thing you see in the middle of the floor is a mystery table with a pitcher of water and a silver bowl. What’s that for? Well here’s the story. A nice lady asked what fragrance we liked. “Lets try Bergamot.” Smells good in tea so it should smell good on the hand is the reasoning. The nice lady then will take your hand and rub it with a sea salt scrub. Then wash it off with water from the pitcher. It feels great to have your hands massaged. Smells spectacular too. Yes it’s free-- but you are done for. Let’s face it, at that point we owned it and walked out of there with more stuff. There is something for everybody, even kids. 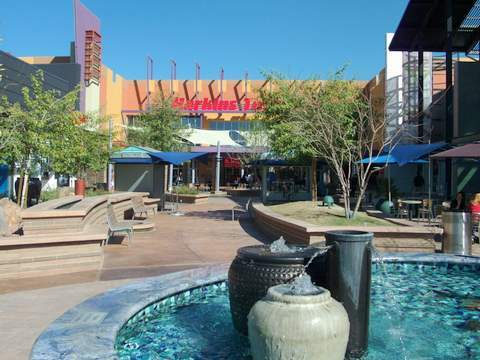 The main focal point of the SanTan Village is the Harkins Theaters. If you drove by them on the freeway when it was being built, there was just no clue what it was going to be. Now it’s a place to hang out with friends and enjoy some good movies. A huge food court is right next to it. 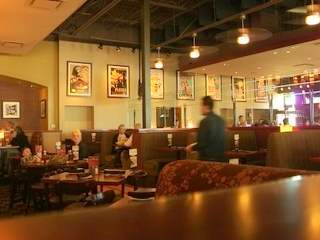 The acoustics of the Harkins Theater are crisp and noticeably superior. We saw a movie called Cloverfield about this Godzilla like creature go romping through NY City and the sounds were just right. It was not too loud but enough that you might jump out of your seat. And you will be happy to leave without your ears ringing from excess volume. More stores are being added to the Village and you will love to discover places you might not see anywhere else. The “Urban Village” area is south to the outdoor mall and has stores like Wal-Mart Supercenter, Sam’s Club, IN-N-OUT Burger, etc.